Another beautiful day outside and, of course, in the space suits. 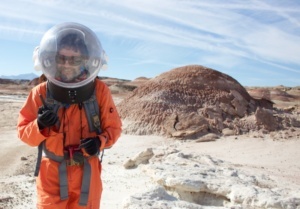 Crew geologist, artist and me went to scout the Martian roads for samples, inspiration and data for the articles. I love to ride on ATV in the space suit, no dust on your face, warm and safe. But to climb even a little hill gets tricky and feels like you have never done it before. For Annalea it was a first EVA so far. We were all worried and excited about how she would feel physically and mentally. Our crew artist amazed us, she was the first to find hypoliths. 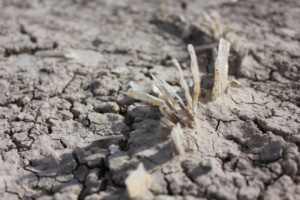 Basically, these are microbial colonies growing beneath the stones. 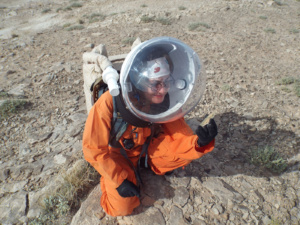 It is important to be cross trained by our scientists, therefore the crew members with not related skills are also able to find the hypolith samples. Annalea’s discovery proved today that anyone can be cross trained and assist the crew biologist and geologist. The outcome of scientific operations of this mission will greatly increase. (magnify), if we also implement such an approach to our second part at the Arctic station. 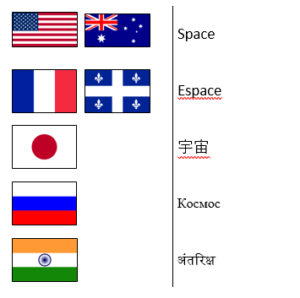 By looking at proposed Mars missions in the space history we often see that future Mars astronauts would need to have several professions and be able to easily learn new skills in order for the efficient operational work on Mars. 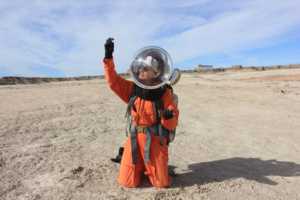 What we are doing at Mars Desert Research Station is an important experience, which will help us understand better ways of preparing the Martian astronauts. I began a field sketch of not too complex an outcrop of cross-bedded sandstone with the conglomerate top at the dry creek on the way home. It’s an old river channel that has eroded away with different sets of sand waves deposited one on top of the other. We were on our way back to the hab towards the end of our EVA, close to midday and it was pretty warm. I chose long charcoal sticks even though I never sketch in the field with these as I didn’t want to use a knife to sharpen pencils with bulky space gloves. Meanwhile, its apparent the sketchbook itself is too big – hard to handle in the space suit. I drew from the edges of the outcrop. Each part is related to the other in some way and I needed to constrain the outcrop boundaries to determine attitude (the angles at which the outcrops occurred), structural relationships and thickness in the cross bed sets in terms of layering, unloading, rock distribution, erosion and so on. On the top of the sandstone I sketched in the conglomeratic unit. Maybe it was caused by debris flow but I am guessing. I drew in vegetation to give scale, and shadows to give three- dimensionality. I tried to see simple lines, divide the outcrop into differently orientated planes as well as indicate the texture. You know I don’t think much about what the drawing looks like. You can tell its a pretty bad drawing but as long as I can catch something that indicates how the outcrop was formed, for instance the processes of deposition or the direction of the currents which deposited the sediments, I’m happy. Drawing is a practice, I can only improve and field drawing is about some kind of narrative, like field geology is an historical narrative science. Half an hour later I am still drawing into the sun, there is a lot of glare. Sweat from my forehead kept trickling down in to my eyes and I really had had enough. Little flies were walking around on the face of my visor while I was drawing. After driving five kilometres on the quad bike and three hours in the spacesuit I realised field sketching should be an activity that should be done early in the EVA not towards the end. Surprisingly though, the charcoal was reasonably successful as a drawing tool, perhaps because it’s versatile in terms of drawing texture and it suffers mistakes well. The upside is that no rubber was needed, I just smudged mistakes away with my glove. The down-side is that charcoal needs fixing. Should have brought the hairspray but would this work on Mars ? Probably not. 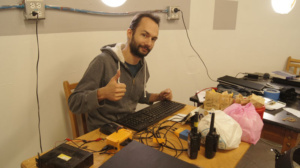 Overall, as a process sketch in the field, test one was successful. I understand quite a lot now about the outcrop as every mark on the page is something I have seen. 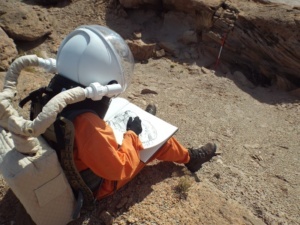 I realise more about the physical limitations of drawing in the space suit and I understand timing is important in terms of when the field drawing is scheduled. And I have begun to think clearly about tools and techniques. Next, I will take the drawing to geologist Jon Clarke who helps me recognise what I have drawn. 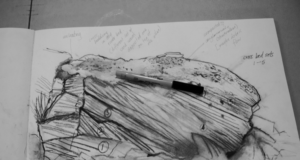 Then if it is useful for the science, I’ll use my field sketch and the documentation of the outcrop to create a figure drawing that focuses on sedimentary processes. 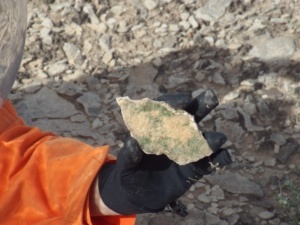 Today’s EVA was by ATV north along Cow Dung Rd to Tank Wash where previous crews had reported scattered gypsum which the crew geologist (me) was interested in. Anastasiya, whom I am cross training in field geology, and Annalea, who is learning geological field drawing, were also on the EVA. Owing to a navigation error by the EVA leader (me again), we ended up much further north than planned. Two good things happened as a result of this error. First of all we found a much denser occurrence of gypsum veins than we had expected at Tank Wash.
Secondly, Annalea, diligently turning over thin sheets of weathered sandstone in an old inverted channel discovered abundant chasmoliths, photosynthetic microbes living in cracks in the rock. These are very important niches for desert microbes, and martian equivalents might similarly inhabit protected niches Mars. Chasmoliths closely related to hypoliths (photosynthetic microbes living under small rocks) and endoliths (photosynthetic microbes living inside rocks). Today’s adventure illustrates the capabilities of human explorers. No planetary robot yet built, designed, or even realistic conceived would be able to find the hypoliths we found today. 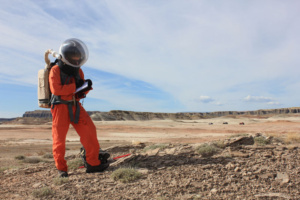 The tools needed have not been designed and are two specialised for general use of Mars. 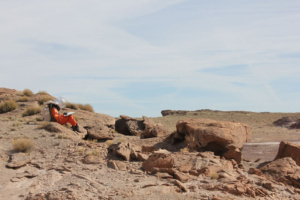 Also, the pace of robotic operations is so slow it would not be an appropriate use of time resources to split dozens of rocks and overturn dozens of others, in a hypolith and chasmolith search. It also illustrates the importance of the unexpected in scientific exploration. 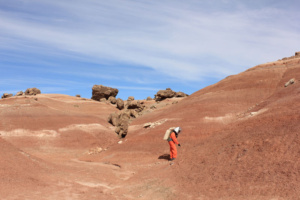 The discovery of orange soil by the Apollo 17 astronauts, or the fossil hot spring deposits in Gusev Crater by the Spirit Mars Rover team, provide other examples. It is often the unexpected discoveries that are most important. After a final stop for Annalea to rough out a sketch of cross-bedded pebbly sandstone, we returned to the station. Field sketching like Annalea’s is an important tool in recording and presenting scientific observations. This ancient technique, dating back to Leonardo da Vinc, is still and important skill in the digital era. It can’t be done with current space suit gloves, but may be possible with future gloves, perhaps using the Mechanical Counter Pressure technology already being tested. How to best record such visually interpreted data in the field under Mars analogue conditions is one goal of our work here in Mars 160. 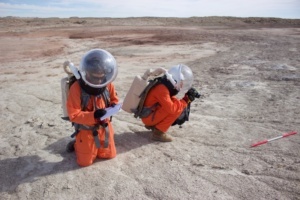 Maybe people will one day be making field sketches on Mars, either in suits or from the comfort of a pressurised vehicle.